Mayada Hamdo Torkmany and her six children dodged sniper fire and survived a barrel bomb as they fled Syria. Roughly 2,000 Syrian refugees may be relocated to the states this year, with Chicago being among the major cities that will receive them, a recent State Department report indicates. That number is a big jump from the fraction of families who make it to safety from war-torn areas of the world like Syria. The Torkmany family is among just four who’ve resettled in the Chicago area since the Syrian Civial War erupted four years ago. Mayada Hamdo Torkmany learned that her husband had been shot in the head by a sniper when a stranger who saw the murder picked up the dead man’s cell phone and called her to break the news. "He was coming home and he was executed by a sniper," the emotional widow told NBC Chicago. While time has passed, her grief has not. Torkmany knew she could no longer protect her family from the daily shootings, arrests and bombings in her hometown of Homs, Syria. She described how opposition forces would shoot at random people, go into their homes and imprison men and children. She and her six children fled to Damascus but soon learned they weren't safe there either. "Something just dropped on our home and we all passed out under a huge cloud of smoke," said 19-year-old Zayd Torkmany. It was a barrel bomb, and when shrapnel was launched in all directions when it hit their house. Chunks of metal struck Zayd, his 13-year-old sister Wedad, and Mayada Hamdo Torkmany. The children desperately needed medical care but it wansn't safe to go to a public hospital. "They took Wedad and me to a field hospital because if I go to the public hospital I would get arrested right away because of the regime,” said Zayd Torkmany. The children were taken to a secret underground hospital. NBC 5 Investigates has reported extensively on these temporary field hospitals – located in bombed-out buildings, basements and farm houses. The family eventually escaped across the border into Lebanon. 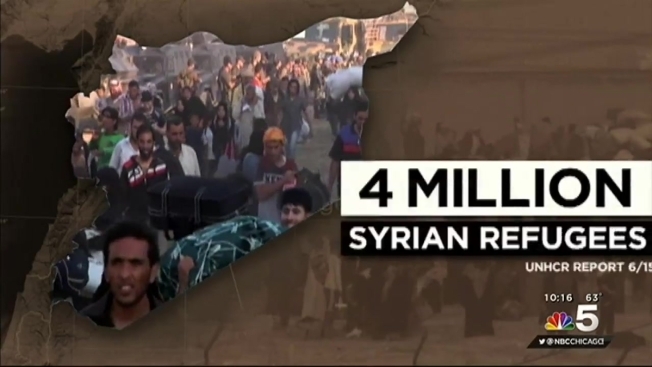 Roughly four million refugees have fled Syria into bordering countries, according to a report released this month by the United Nations High Commissioner for Refugees. But unlike most refugees, the Torkmany family received asylum into the United States. "Less than one percent of the world refugees get resettled every year," said Melineh Kano, the Executive Director of Refugee One in Chicago, which has helped resettle just four families since the violence began in 2011. Republican lawmakers raised concerns this week on the Hill that terrorists could slip into the U.S. through the State Department's expanding resettlement program. A Congressional hearing this week addressed the issue. "This is a serious Homeland security concern of mine," said Congressman Michael McCaul, R-Texas and House Homeland Security Chairman. "We know from intelligence reports directly from ISIS and Al-Qaida that they would like to exploit the refugee program." The State Department maintains there is no national security risk. During a recent visit to Refugee One, the Under Secretary for Civilian Security, Democracy, and Human Rights with the State Department spoke to NBC 5 Investigates about the screening process. "There have been instances in the past where we have learned there were problems," said Sarah Sewall, Under Secretary for Civilian Security, Democracy, and Human Rights. "So what we’ve done is we’ve increased our efforts accordingly." But these more stringent background checks have created a backlog. Meaning families like the Torkmany’s will be in limbo much longer. "When we first came here it was really difficult because we don’t speak any English," said Mayada Hamdo Torkmany’s brother Sobhe Torkmany, who also fled Syria. The readjustment is never easy and the emotional scars remain. "A lot of them had to deal with losing their homes and having all kinds of bombs and shrapnel falling on them,” said Suzanne Ahkras Sahloul, founder of Syrian Community Network. "They are carrying those scars with them." Local organizations like Refugee One and Syrian Community Network provide counseling, services and a support network to Syrian refugees relocating to the Chicago area. As for the Torkmany family, they have settled into a modest house in Evanston – far from their neighborhood in Syria where friends were killed and family members kidnapped. "I’m not afraid anymore like I was in Syria," said Wedad.